Pick up any text on leadership or strategic planning, and you will read about the importance of core values in guiding organizational decisions and behaviors. Indeed, in his excellent book, Mission Mystique, Charles Goodsell cites Philip Selznick’s classic work that suggests model institutions are “…bathed in these values as they execute and elaborate policy.” He also noted the “institution’s leadership must be prepared to defend the integrity of the institution’s values against undesired encroachment.” As I recently watched and read about the latest institutional scandal, this time involving USA Gymnastics and Michigan State University over the failure to respond to complaints of sexual abuse by female athletes at the hands of an osteopathic surgeon, like many I find myself asking how does this happen? A significant part of the answer is the failure by leadership at all levels to take the steps necessary to not only develop meaningful core values, but also to integrate these values into the fabric of organizational life. Public administration practitioners would be well served to read the extensive literature that documents how core values must not just be constantly talked about by leaders at every opportunity, but must be visibly reinforced across key organizational systems including job descriptions, recruitment and selection, training and development, performance appraisal and promotion/rewards. Core values like respect, service, integrity and stewardship are wonderful concepts that look nice on websites, screen savers and wall hangings, but the hard part is demonstrating fidelity to these values in daily decisions and behavior. I challenge the readers of this article to ask themselves how many times core values are discussed or visible in their institutions and their own departments. In my discussions with local government managers on this topic, they recognize the importance of core values, but they also acknowledge the challenge of staying focused on these values amidst the “rough and tumble of daily work life.” They are referring to the political, fiscal, time and public pressures that crowd out attention to core values. James Waters suggests managers “often experience the stress of being morally on their own” amidst the pressures of their jobs. Absent the focus on stated core values, the “undesired encroachment” of rogue unstated values like “protect the institution’s reputation,” “just win, baby,” or “generate revenue” can drive decisions and behaviors. Such rogue values seem to have engulfed our institutions of higher education with high profile Division I sports programs (consider other recent examples like Louisville and Penn State). Kenneth Kernaghan notes “both practitioners and academics need to focus more attention on how values can be best integrated into the structures, processes, and systems of public organizations.” This is why the work of scholars like Jim Svara is so important, as he continually provides panels and workshops on how to integrate the ASPA Code of Ethics in public organizations. In their book, Built to Last, Jim Collins and Jerry Porras argue that core values are “the glue that holds an organization together as it grows, decentralizes, diversifies and expands.” What is the glue that holds your organization together? A strong sense of core values just might increase the probability of individuals standing up and not looking the other way when these values are being undermined. 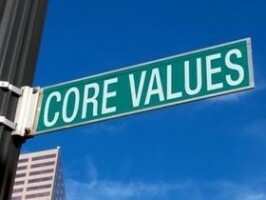 Developing and integrating core values is not just a “nice thing to do”, it is good business whether you are a government, nonprofit, or private organization. Just ask those organizations that have lost their way and experienced the tragic consequences.